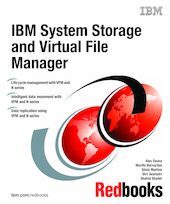 This IBM Redbooks publication describes how IBM System Storage N series Virtual File Manager (VFM) logically aggregates user file data distributed across heterogeneous environments and provides administrators with tools and policies to automate data management. VFM is designed to provide data management functionality for server and storage consolidation, migration, remote office data management, and disaster recovery while avoiding disruption to users. VFM provides this functionality through automated policy-based data management leveraging a global namespace.